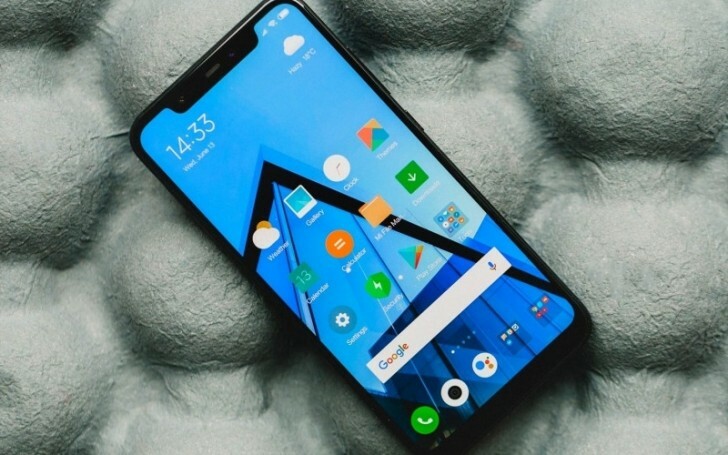 Update: The image of the Pocophone F1 by a Romanian retailer is actually the Xiaomi Mi 8 from the AndroidPit review. We are yet to see an actual photo of the new device. Original story follows: Xiaomi is about to launch a phone that is currently called Pocophone F1, although this might not be the final name of the device. First it was certified for Bluetooth connectivity and then popped up on AnTuTu. Yesterday, a Belarusian site listed some specs, but today we saw another leak, accompanied with a live image, this time coming from Romania, that gives slightly different spec sheet. Clearly one of the sources is wrong, but time will tell which one. The Romanian retailer PC Garage says the Pocophone F1 will have Snapdragon 845 with octa-core CPU and Adreno 630 GPU. RAM is listed as 6 GB, while storage is 64 GB with a slot for microSD in the hybrid SIM slot. So far, so good, both sources are in line. Camera setups are also the same - 12 MP + 5 MP on the back, 20 MP on the front. Now this is where it gets interesting - while the source from yesterday said Pocophone F1 will have 6.18” Full HD+ screen, the Romanian leak suggests 5.99” IPS panel. The screen ratio is also different, but both point to a notch solution, which is hardly a surprise anymore, given that Xiaomi has implemented the infamous screen cutout both at the Mi 8 flagship series and at the affordable Redmi 6 portfolio with the Redmi 6 Pro (also known as Mi A2 Lite). The new listing includes a price tag of RON1,999 or the equivalent of €430/$500. If this is correct, it could be one of the cheapest Snapdragon 845-powered smartphones on the market. And since it appeared both in Belarus and Romania, at least the Eurasian and EU regions might see the phone in their respective markets. Cheers for the tip, Mihai S! IPS and a notch. The Mi 8 was forgivable because it had an AMOLED screen. But they ditched the great looking glass on the back, put an IPS screen and want to sell it for the same price? Would like to hear overall feel of the device quality... How bright is the display? Heavy? Camera sensor used? Imx363 like all flagship siblings? And how dependable is "the liquid cooling system" or just a gimmick?